A 15-year old who had been locked up overnight in January in a case of mistaken identity received a written apology from the Chief Inspector Humberside Police and his DNA samples back. This is most unusual as when an innocent who has been arrested manages to convince the police that his or her case should be considered an ' exceptional case' –the only way to get off the DNA database–, the normal procedure is for the DNA samples to be destroyed and all the associated records (DNA profile, fingerprint, Police National Computer entry, etc.) deleted. This is the first case I am aware of where the police returns the DNA samples. [...] Joshua, described by teachers as "a lovely lad" spent the night in a cell at Priory Road police station, had his fingerprints taken, a DNA sample swabbed from his mouth, and was photographed for a mug shot. He was not released until yesterday morning, at about 10am. 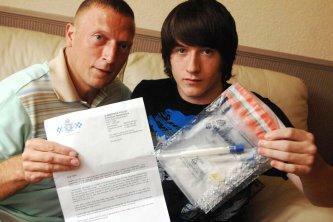 [...] Mr Lever said: "Further enquiries revealed this boy was not involved and was released from custody. "We are sorry he was arrested and kept in a cell overnight. For this I apologise." [...] Despite the ongoing claim, the Stevens family are claiming a victory after receiving a written apology from the force and they have been given back Joshua's DNA samples – an unprecedented move by Humberside Police. It remains extremely difficult for innocents to get off the National DNA Database. For help, check out the Reclaim Your DNA website created by GeneWatch UK and other organisations. If you succeed in getting off the DNA database, it is most likely your DNA samples will be destroyed and not returned to you. Bootnote Hat tip to SC.